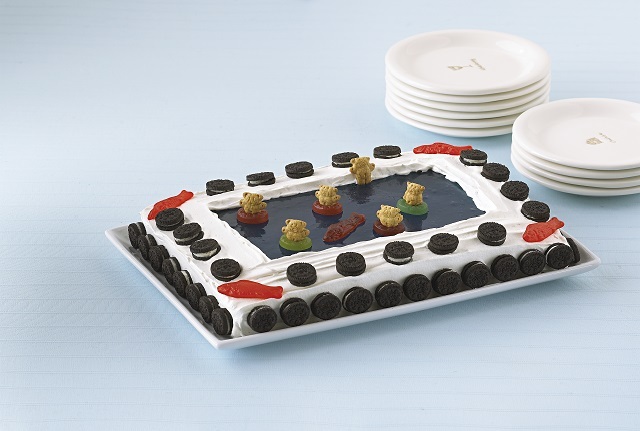 This JELL-O cake is a tidal wave of fun—complete with a shimmery gelatin pool and bear-shape graham snacks floating on chewy fruit rings. Prepare cake batter and bake in 13x9-inch pan as directed on package. Cool completely. Invert cake onto platter; remove pan. Use serrated knife to cut and scoop out shallow rectangle from center of cake, leaving 2-inch border of cake on all sides and thin layer on bottom. Reserve removed cake for snacking or other use. Add boiling water to gelatin mixes in large bowl; stir 2 min. until completely dissolved. Stir in cold water. Refrigerate 1-1/4 hours or until slightly thickened. (Or, see Shortcut Tip for quicker set method.) Pour into center of cake. Refrigerate 3 hours or until gelatin is firm. Frost borders of cake with COOL WHIP. Decorate with remaining ingredients as desired to resemble a swimming pool. Keep cake refrigerated. Insert bite-size fish-shaped and octopus-shaped chewy fruit snacks into gelatin "pool" before refrigerating. For a quick-set gelatin, add 4 cups ice cubes to dissolved gelatin instead of the 1 cup cold water; stir 8 min. or until gelatin begins to thicken. Remove any unmelted ice. Pour thickened gelatin into center of cake; continue as directed.